During some recent Polycom RMX work, it was discovered that the RMX's (2000 and 1800) would not accept certificates into the trust store with an expiration past the year 2038, seemingly related to the article here. After some triage, I found it was possible to work around the issue of using RMX Manager which would not take the certificate by using SSH/WinSCP to manually update the required .crt and .xml certificate bundle and configuration files respectively, which I've detailed below. The ca-bundle-client.xml file contains XML formatted details of the trusted certificates. The ca-bundle-client.crt file is a file containing the PEM of each trusted certificate. 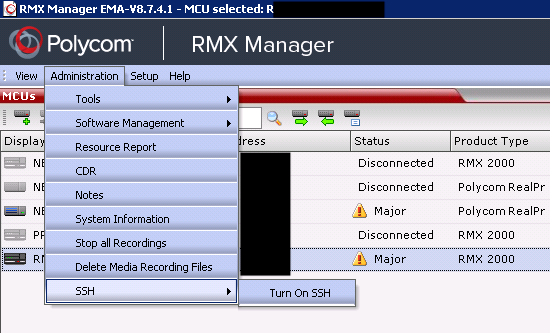 SSH to the RMX and log in with user rt3p1aa (Polycom support will provide the built-in password). Once logged in, su into root (again Polycom support can provide this password). Before continuing, create a backup of the original files. Using vi edit the ca-bundle-client.crt file, and append the PEM formatted version of the certificate you want to install on the RMX. Ensure a new line is left between the existing PEM and the one you are entering. Copy the ca-bundle-xml to the /tmp directory. From their use WinSCP or equivalent, to download a copy of the file. Using Notepad++ or equivalent, edit the ca-bundle-client.xml file. Following the same syntax as existing certificates, update the file with details of the new certificate. The XML should end with the closing tag </CERTIFICATE_AUTHORITHY_LIST>. An example is shown below, noting the opening tab <CERTIFICATE_DETAILS> follows directly after the preceding certificate block which ends with the tag </CERTIFICATE_DETAILS>. At this point reboot the RMX. Once it comes back online the trust store should include the manually added certificates.